(LWI) - Four years ago, thousands of people fled the Boko Haram terror in Nigeria to Cameroon. Now, the Minawao refugee camp sees a wave of refugees spontaneously returning to unsafe areas in eastern Nigeria, because resources have diminished in Minawao. An LWF project uses local means of mass communication to educate refugees on security, and about the aid they can get if they decide to go anyway. “I have seen what Boko Haram does there, that’s why I tell people not to go.” Lydia Musa says. She had to flee the Nigerian town of Pulka, because of Boko Haram attacks, and found safety in Minawao refugee camp, Cameroon. After four years in Minawao refugee camp she tried to go back to Pulka, but after three months returned to the refugee camp in Cameroon. Lydia Musa, her husband and nine children live in Minawao refugee camp, in the extreme North of Cameroon. It is by no means a safe place, and largely off limits for Western aid workers, but no comparison to the terror the family faced back home in Nigeria. In eastern Nigeria, Boko Haram is attacking villages and waging war against its own government as well as the two neighboring countries. The family fled four years ago, after their home town Pulka in Nigeria’s Borno state was attacked and taken over by Boko Haram. Musa recalls burning houses and cars, the militia plundering and killing people at will. The entire infrastructure, including schools and health centers, was destroyed. In 2017, the Nigerian army recaptured the town, but unconfirmed reports still speak of attacks and abductions. Despite the danger, thousands of refugees from Minawao decided to return to Pulka in the summer of 2017. “They had reduced the food rations here in Minawao camp, there was just not enough anymore”, Musa explains. “The monthly ration only lasts for 20 days, then I had to collect firewood and sell it to be able to feed my children.” She was not the only refugee resorting to that measure - Minawao, which once was set in a forested landscape, now looks like a desert. Aubin Nzali, a mass media officer of The Lutheran World Federation (LWF) in Cameroon, has heard many similar stories. “We had a wave of massive spontaneous return in February and March, when the food rations in the camp were reduced,” he says. “Many people leave on the weekends, when there are less aid workers around. They think that by now the situation at home has improved. When they arrive they see that it has not.” Many refugees pay with their lives for that information. In Minawao camp LWF has conducted a campaign to inform the refugees about the risks associated with a spontaneous return – and to support to those who still decide to go. For two months, the LWF team organized concerts and big events where returning refugees shared about their experience back home. 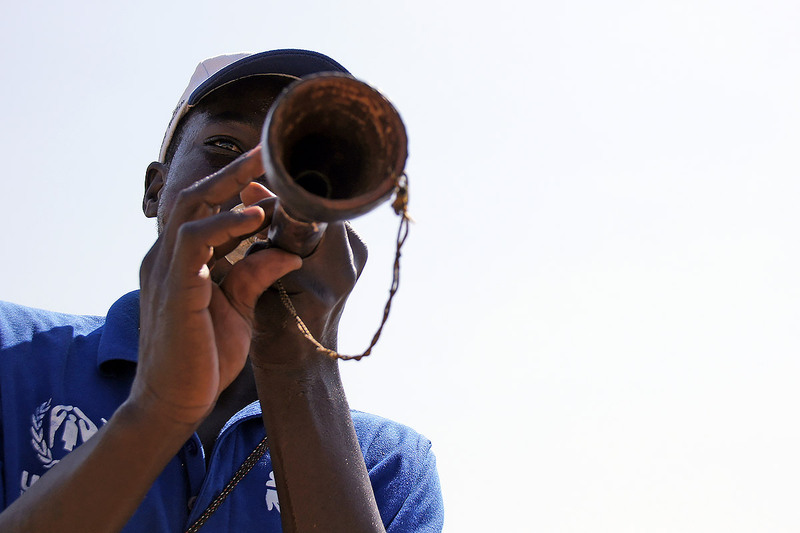 “Griots”, people who orally transmit stories and news by way of songs and entertainment in the rural areas, informed with special songs about the dangers of return without assistance. Almost 60,000 Nigerian refugees have received information and support this way. We want to facilitate a return in dignity. The Musa family has decided to stay in Cameroon. A tripartite agreement between the government of Cameroon, Nigeria and UNHCR, has led to measures to sustainably integrate the refugees into local communities. The issue of firewood and food has been addressed through different LWF projects for reforestation and income-generating activities.